In the end of December an envelope from New York City arrived in my post box. In it was the Outlier Woolback OG pants, and I have worn it since; with exceptions of it being in the laundry, which needed to be overnight as I didn't want to wear anything else. 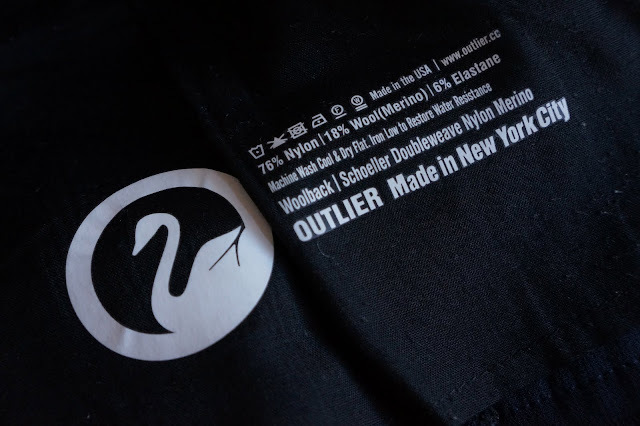 Which means I have been wearing the Outlier Woolback OG since roughly seven weeks, and I will continue to wear it till spring arrives and temperatures are above 0°C again. Winter in Finland means temperatures beneath 0°C for around four to six months. In 2011 we had six weeks in which the thermometer didn't go over -15°C, 2012 has been a lot milder so far, with temperatures varying between -3°C and -30°C. And these temperatures do not include the wind, which constantly blows in Tampere. So freezing cold temperatures are something you not just have to cope with when out hiking or skiing in Lapland, nope, they're everyday fare: Grocery shopping, walking with my son, cycling to the climbing gym, walking to a Café. Very quickly you're looking for clothing which puts function before fashion, which means I'm nearly always wearing long johns and when I can get away with it, a hiking pant. They're just more windproof than a jeans - which is the absolute worst garment I can imagine for winter use, as the wind blows through them and they stay cold. Nope, jeans might be looking good, but they're terrible winter leg wear. But sometimes I can't get around wearing jeans, as visiting clients in hiking pants, while keeping me warm, might not look too professional; not to mention the sporadic dinner or party. And while I occasionally was looking for alternatives to the much dreaded jeans, I never found something locally. Happily the internet allows me to shop for superior products, be they from Japan, Spain or the USA. I don't remember how I found Outlier. Maybe because they have a cooperation with Hyperlite Mountain Gear for a UL city backpack. Yeah, that probably was it. They're a small company, manufacturing in the Big Apple, and combine function, good materials and simple, clean looks into highly practical everyday garments. Browsing their site I quickly saw the Woolback OG pants - their winter pants. It's built on the outside with a Schoeller self-cleaning Nanosphere treatment which gives the pants a nice resistance to dirt, snow and water (and baby spit =), while the inside is lined with brushed merino wool to keep you warm. This has the benefit that I can forgo the long johns till around -5°C, as it keeps my legs warm enough when walking. My size 32 is roomy enough to fit a pair of Woolpower long johns underneath them when the thermometer drops to -20°C or more, while still being not confining - a problem I usually have with jeans. The pants keep the wind out fine, and indeed offer a lot of stretch - cycling and skiing are no problem in them. I wouldn't even think about skiing in Jeans, but the Woolback OG feel so comfy that I sometimes surprise myself when I realize that I didn't change into my usual skiing pants. Did I mention that they look smart? Going to a business meeting or to the Café is absolutely possible in them, even encouraged. While some of my colleagues come in Gore Tex pants and thick puffy pants to work and then change into something more comfy, I can just walk into the office, sit down, looking smart and don't overheat. Perfect. If you're looking for one winter pants, which does it all - take a good look at the Outlier Woolback OG. Technical materials and smart looks combined in one fine pants which keeps you warm and looking cool, on the bike and at the office. I'm not going to wear anything else anymore.